Feigned Outrage: Which Explanation Is Less Credible? One can't possibly know for sure if someone is lying. I leave it to the reader to decide for themselves which explanation is least plausible. 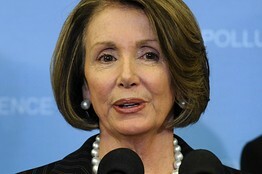 Nancy Pelosi was briefed about waterboarding in 2002 according to documents released by the CIA in response to Republicans' request. Her response: The CIA told her these techniques "could be used, but not they they would" be used. The documents suggest she was actually briefed on methods that had been used. There was apparently no objection made at the time, but now she wants a "truth commission" to investigate. Why a truth commission now and no objection then? Maybe there's a good reason, but we're still waiting to hear it . . . Recently I saw a physician for a personal health issue. He gave me a medication, not a steroid, which he thought was OK to give me. Unfortunately, the medication was banned under our drug policy . . . I've taken and passed about 15 drug tests over the past five seasons . . . I know everybody is disappointed. So am I. I'm sorry about this whole situation. Maybe there's a good explanation for why a man would take a female fertility drug banned by MLB, but we're still waiting to hear it . . .